Algarve private taxis, quality transportation services. Faro airport transfers to all popular holiday destinations, including Albufeira, Lagos, Vilamoura, Portimao, Carvoeiro and Alvor. Book with confidence, Faro airport FAO certified transfer provider. See a list of all the available destinations below. Need a ride? Algarserra is an established local company and leading provider of private Faro airport transfers to any resort, hotel, private villa or holiday accommodation in the Algarve and nearby regions. 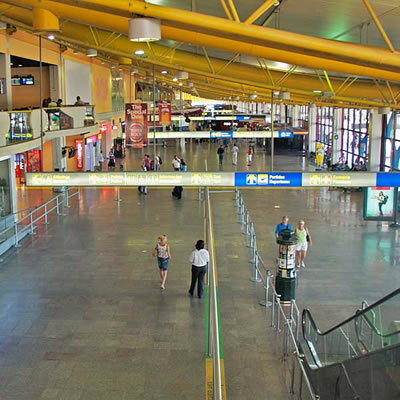 Ground transportation from and to Faro airport aimed at passengers who seek service quality, punctuality and attention to customer satisfaction. Ideal for both individuals and travel agents, carried out by professional drivers and supported by a modern, diversified vehicle fleet. Private transport for your arrival to the Algarve without worrying with flight delays or having to follow strict schedules. Once you land at Faro airport a driver will be at the arrivals hall holding a sign with your name. He will assist you with luggage and lead you to the transfer vehicle outside. In a few minutes you will be on the way to your final destination. We keep our schedule in sync with the airport timetable, so in case of flight delays we automatically adjust your transfer pick-up to the new arrival time, free of charge. Don't ever miss your departure flight. Private transfer for the return adjusted to your flight schedule. A driver will meet and greet you at the hotel, assist you with luggage and drive you straight to the airport. Just provide us with your accommodation address, pick up date, time and flight details. We will check it against the distance to Faro airport, flight departure time and current traffic conditions. If we expect a longer transfer time to the airport we will get back to you with our best advice for the new collecting time. Choose our private transfers. Why? 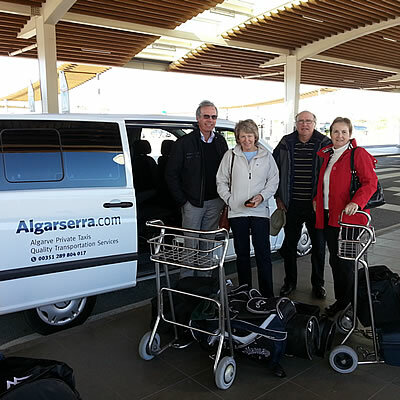 Algarserra transfers to and from Faro airport are cheaper than regular public taxis, faster and more comfortable than a public bus or shared shuttle service. Avoid waiting in lines, filling paperwork or following strict schedules for shared transport. With our private transfers you can choose the vehicle, the exact pick up location and time that best suits your travel needs. See below the main features of our service. We monitor your flight status and will welcome you at Faro airport for the arrival transfer and wait by your hotel reception for the return transfer. Pick up times always adjusted to your flight schedule. No risk if your plans change. You can easily modify or cancel a transfer reservation at any time, directly from your booking voucher. No fees applied and any due refunds will be transferred back to you. We meet all the insurance and safety legislation requirements. We are a fully licensed passenger transportation company, certified by Faro airport as an official transfer provider for all the Algarve. While public taxis charge per travel time and distance, our transfer prices are fixed for each destination and generally cheaper than regular public taxis. Regardless of transfer duration, you already know the total price beforehand. Transfers for your travel group only. Avoid the crowds, following strict shuttle time tables, waiting in lines or worrying about loosing your luggage along the way. Get quickly to your holiday destination, hassle free. In accordance with Portuguese legislation, in all our transfers children under 12 years must travel on appropriate restraint seats. When booking a transfer you can request baby seats and / or booster seats for free. We operate a modern and diversified transfer fleet under constant renovation. We take our vehicles maintenance seriously and strive to keep them clean and pristine for each transfer service. All vehicles have air conditioning. Unlike public taxis that charge an extra fee for using the vehicle boot, in our private transfers we transport your luggage for free and the number of volumes you can bring is only limited to vehicle capacity. All prices show are final and you won't be surprised by unforeseen expenses upon your arrival. All additional options, extras and prices are clearly displayed during the booking process. There will be no hidden costs. Simple, fast and intuitive steps to make your transfer reservation. All you need is your accommodation address and flight details. Choose a vehicle that best suits your needs and tell us when to pick you up. Whether you pay in advance online or later to the driver, transfer confirmation is immediate and sent to your email. Rest assured knowing that a private chauffeur will meet and greet you at Faro airport. Algarserra provides both individuals and travel agents with a private transportation service for all budgets, ranging from low cost, economic transfers to executive VIP transfers. Ideal for passengers arriving at Faro airport, looking for a practical and comfortable way to reach their final destination. Powered by a modern and diversified vehicle fleet capable of handling all group sizes and efficiently accommodate all their luggage. This entry line of taxi transfers up to 4 passengers is the most popular choice as it covers the airport transfer needs for the majority of passengers arriving at Faro airport - couples, small families and small groups of friends with normal luggage volumes, willing to spend less but still get a nice vehicle for a private transfer. Affordable prices without scarifying quality service, carried out on modern vehicles equipped with air conditioning. Comfort as standard. For the most demanding clients, corporate events, picking-up important guests at the airport or simply for treating yourself, we operate airport transfers on high-class, more comfortable and elegant cars. You can choose from spacious executive MPV's up to 4 passengers or VIP BMW's 5 series and Mercedes E class up to 3 passengers. All vehicles are equipped with air conditioning, leather seats and tinted windows for more privacy and viewer discretion. Ideal for groups up to 8 passengers, for families with several children or for those carrying lots of luggage or non-standard volumes such as golf bags, surf boards, bikes and pushchairs. The vans used for these transfers have the largest baggage compartment in our fleet, making them a popular choice amongst golf players and surf enthusiasts. In this category we also provide VIP Mercedes Viano minivans up to 6 passengers for the most demanding clients. This type of transport is intended for groups of 12 to 16 passengers. Minibus transfers are usually requested by small excursions arriving to the Algarve or for picking up event guests and conference attendees at the airport. For families travelling together or large groups of friends this is also a good option for their transfers between Faro airport and their holiday accommodation. All minibuses are equipped with air conditioning. 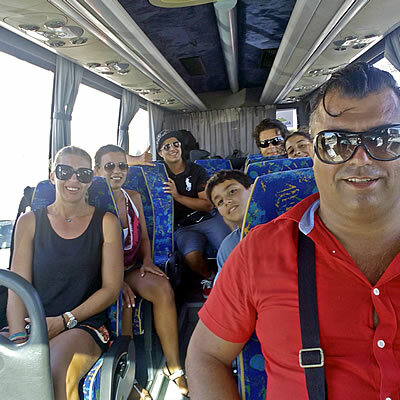 For larger groups we operate quality buses & coaches with 24 and 49 seats to comfortably transport all the passengers and accommodate their luggage. Mostly targeted for tour operators and corporate events, our team is experienced in dealing with group organisers, providing them with greater communication and cost effective travel packages which include not only airport transfers but also their clients tours and excursions in the Algarve. Algarserra also operates accessible transfers, provided by a van converted for the transport of one person in a wheelchair together with 4 more passengers - 5 in total. It is equipped with a rear-entry slide-out ramp, providing obstruction-free access to an uncluttered area in the back of the vehicle. This transfer service is only available upon direct request. Please contact us directly as early as possible. All the main tourist cities, resorts, hotels and most visited places in the Algarve are located more than 20 km to the east or west of Faro airport, making private transfers the fastest, most comfortable and cost effective way to get to your final destination. Algarserra specializes in quality Faro airport transfers with affordable prices to all the Algarve and to popular Spanish destinations near the Portuguese border. See bellow a list of the most popular destinations. Albufeira is the #1 destination in the Algarve, very popular amongst British and Irish tourists. After arriving at Faro airport you can count with our economic transfers to Albufeira. Meet and greet service at the arrivals hall and a fast ride to your hotel or resort in well under 45 minutes. Private taxi transfers supported by several types of vehicles travelling back and forth the 46 Km distance from Faro airport to Albufeira, covering popular locations such as the Albufeira old town, Oura, Olhos de Agua, Gale, Acoteias, Montechoro, Sao Rafael, Guia, Salgados, Falesia or any destination around the area. 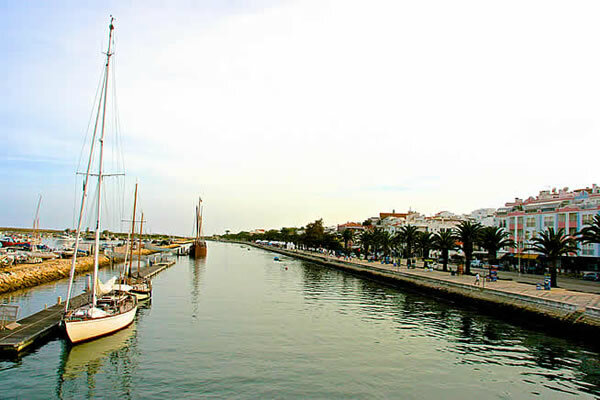 Lagos is firmly on the top 5 Algarve destinations and remains a very popular holiday location for German and Dutch tourists. Lagos is the farther west city in the Algarve - the distance from Faro airport is around 82 Km and transfer time is approximately 80 minutes. Our fleet is composed of spacious and comfortable vehicles and when booking your transfer to Lagos you can choose between the A22 highway for a faster journey and the national road N125 for a money saver. In case of transfers destined to Praia da Luz, Meia Praia or other nearby beach resorts, the price remains the same. 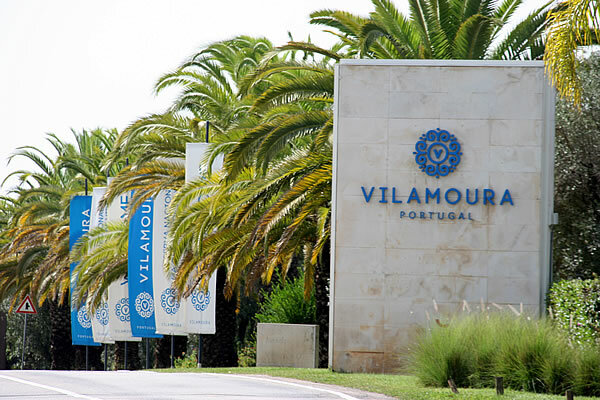 Vilamoura is amongst the famous Algarve luxury resorts and is one of the best golf destinations in Portugal. It has the finest golf courses in the Algarve and it's located next to beautiful sandy beaches. Our private transfers to Vilamoura include a personalised meet and greet welcome at Faro airport by a professional English speaking driver. For the most demanding customers our booking engine allows to choose a higher class vehicle for executive and VIP transfers. 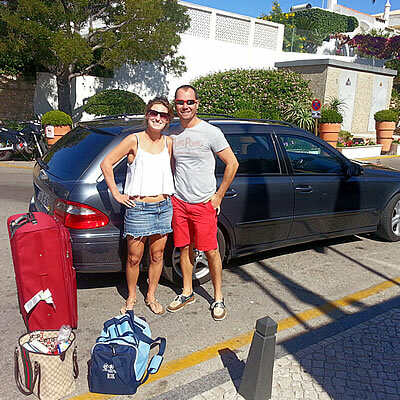 Once at the hotel, you can book our golf transfer service to your favourite Algarve courses. We transport all group sizes and their golf clubs. We are very serious about our work. 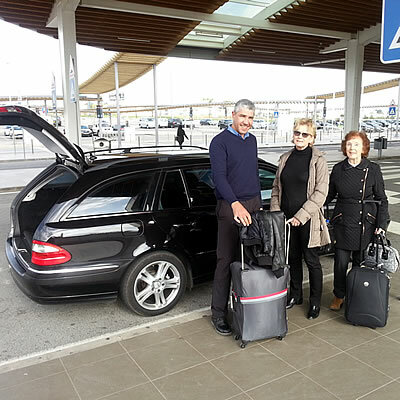 Algarserra has almost two decades of experience providing airport transfers and since the beginning we keep feeding our work process with client comments and reviews. Apart from client's feedback sent directly to us, currently we also use several independent digital platforms to pull together thoughts and concerns from our customers. Easy to book. Confirmed on my phone day before pickup. Picked up on time. Large comfortable vehicle. Helped with luggage. Safe steady driver. Arrived at Faro airport at the quoted time. I would use Algarserra again as first choice if needing a taxi in the Algarve again. Vehicle and driver were fine, only problem driver didn't have right coordinates for our destination. Having said that it was quite a difficult place to find, we were half an hour late... but wouldn't blame the driver... He tried his best. He did make sure our return journey was hassle free... we thank him for that. Website easy to use. Vehicle top class. Driver (Sergio-both times) was excellent. Text message notifications are most comforting. Very good service in all areas! I booked my transfer from the UK, to meet me at the airport in Faro. I was a little worried as did not know of Algarserra, before my travels. Upon reaching the arrivals area, I was greeted by a very polite nicely dressed English speaking transfer agent, she quickly took my details, and introduced me to my driver. The driver too also very professional, my transfer to my hotel was enjoyable, seeing the sights on the way. I also had a return pick up, which the driver was slightly early, leaving nothing to stress about prior to catching my next flight. Thank you Algarserra, I would definitely book with you again! I have used Algaserra a couple of times previously, and have always had great service from them. 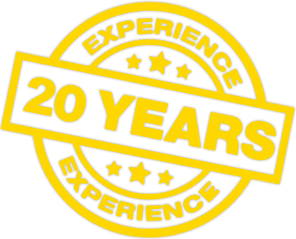 The drivers I have used have always been courteous, friendly and prompt, and the cars clean, modern and reliable. What more could you ask for?! Highly recommended. Perfect transfer from Faro airport to our holiday flat in Tavira. Our driver was waiting where expected, the car was comfy, we chatted throughout the drive & he knew exactly where we were going. Very efficient service. The web booking process worked well, the pick up information was very reassuring late on a Sunday evening. Thanks a lot, will recommend. The total service was excellent. Your drivers were polite, informative and extremely helpful. We have used your services in the past and will do so again in the future. Thank you. 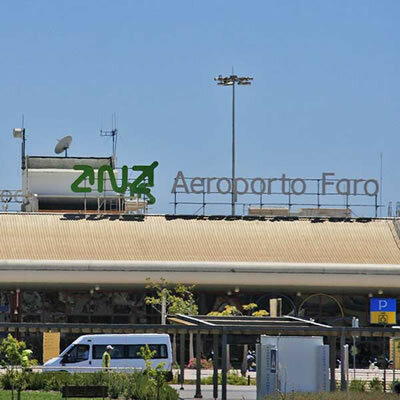 Operating since 1965, Faro International Airport, also known as Algarve airport is the third largest airport in Portugal after Lisbon and Porto airports. Has recently undergone several renovations on the runway and terminal to increase its capacity and is currently the main tourist airport in the country with more than half of the passengers coming from the United Kingdom. The airport is located 9 km from Faro city centre, the Algarve capital. 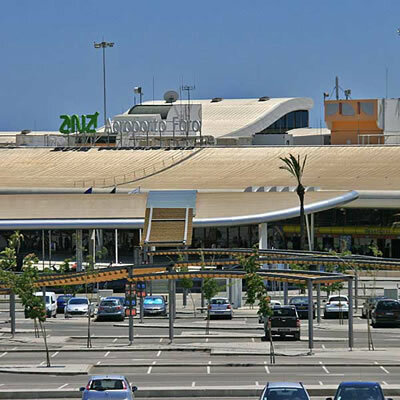 Faro airport serves popular Algarve holiday destinations like Albufeira, Lagos, Vilamoura, Portimao, Carvoeiro or Alvor and is also used as an alternative to Seville airport by passengers going to southern Spain locations near the border, such as Isla Canela, Isla Cristina or Islantilla. Private transport for all travelling itineraries and scenarios. Transfers from and to the airport, train stations, bus stations, cruise terminals, golf courses or between specific locations in the entire Portuguese territory or Spanish destinations near the border. Tailor made services for all types of occasions including airport transfers, golf transfers, transport to theme parks, sightseeing tours, weddings, meetings & conferences or any other venue that requires private chauffeurs for moving people around.